Guilt-free spring rolls! Baked instead of fried means these spring rolls are a healthier alternative. Easy to make, and can be made ahead of time and frozen. Perfect appetizer for a party! Oil-free option. Preheat your oven to 400F (200C). Line a large baking sheet with a wire rack. In a large skillet or frying pan, heat the sesame oil over medium-high heat. When hot, add the cabbage, carrots, shiitake mushrooms, garlic, and ginger. Cook for about 5 minutes stirring frequently until the vegetables and mushrooms are cooked, about 5 minutes. Stir in the hoisin and soy sauce and cook 1 minute more. Remove from heat and let cool before assembling the spring rolls. You can pop it in the fridge to cool faster if you like. Set up a workstation with your spring roll wrappers, spring roll filling, a small bowl of water, and a baking tray fitted with a wire rack. To assemble the spring rolls, take a spring roll wrapper and place it on your work surface with a corner pointing up (diamond shape). Put about 2 tablespoons of the spring roll filling near the bottom corner of the wrapper. Fold up the bottom corner around the filling, then fold in both sides. Wet your finger or use a brush to wet the top edges with water to seal the spring roll. Finish rolling up the spring roll, then place on the wire rack with point side down. Repeat with remaining wrappers until all of the filling is used up. Bake about 25 minutes until golden around the edges. Serve hot with sweet & sour sauce. *For oil-free, omit oil and do a water or broth sauté. *If making the spring rolls ahead of time, assemble them, then store in an air-tight container in the fridge for 1 - 2 days, or in the freezer. 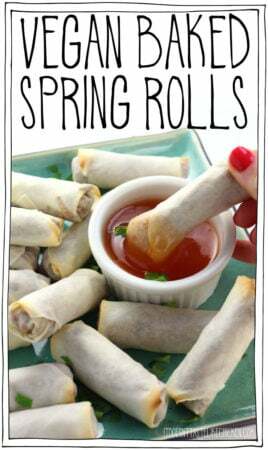 Bake spring rolls from frozen (no defrosting). They may need an extra 5 - 10 minutes in the oven if baked from frozen.